Chelsea Space is delighted to present fashion designer Molly Goddard in a collaborative project with photographer Sarah Edwards. 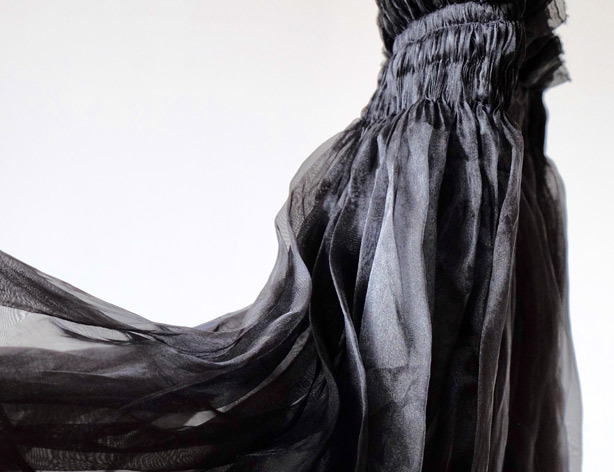 Working together to create a series of images of key pieces from past collections, Dress Portrait presents their shared interest in photography, light and texture. The way Edwards' photographs are displayed reflects the part photography plays in Goddard's thought process and the multidisciplinary approach Edwards applies to her work. This new installation includes Edward’s photography from the Molly Goddard archive, and a garment especially selected by Goddard. The Reading Room, in collaboration with students from Chelsea College of Arts MA Curating and Collections, explores the designer’s process through previously unseen notebooks, research material and studio equipment. Molly Goddard established her eponymous label in 2014 in London. A clear thread runs through Goddard’s collections, with high‐intensity processes such as smocking, shirring and handcraft utilised in unexpected ways. She is known for her signature tulle and bold approach to scale and proportion, often using tens of metres of fabric in a single dress. Her clothes challenge the idea of wearability and bring joy: they are celebratory yet remarkably robust, equally suited to the pub as the red carpet. Sarah studied Fine Art Photography at The University of Westminster in 2012 whilst teaching Art at Fox Primary School in Notting Hill Gate. Molly and Sarah have collaborated on Set Designs for London Fashion Week and Dover Street Market. Each exhibition at Chelsea Space is accompanied by a publication, published by Chelsea Space. • Gallery opening times: Tues - Fri: 11:00 – 17:00 and by appointment. • Chelsea College of Arts is one of the world’s leading art and design institutions. • Located at Millbank, next door to Tate Britain, Chelsea specialises in Fine Art, Graphic Design and Interior and Textiles Design. Since its origins in the 19th century, the College has produced many of the greatest names in the arts, including: Quentin Blake (illustrator and author) Ralph Fiennes (film and stage actor), Anish Kapoor (sculptor), Steve McQueen, (artist), Chris Ofili (artist), Alan Rickman (film and stage actor), Alexei Sayle (comedian) and Gavin Turk (sculptor).